lovers of the high life. For marine lifestyle enthusiasts and potential buyers from across the region, the high calibre of yachting brands and dealers on display will not disappoint. 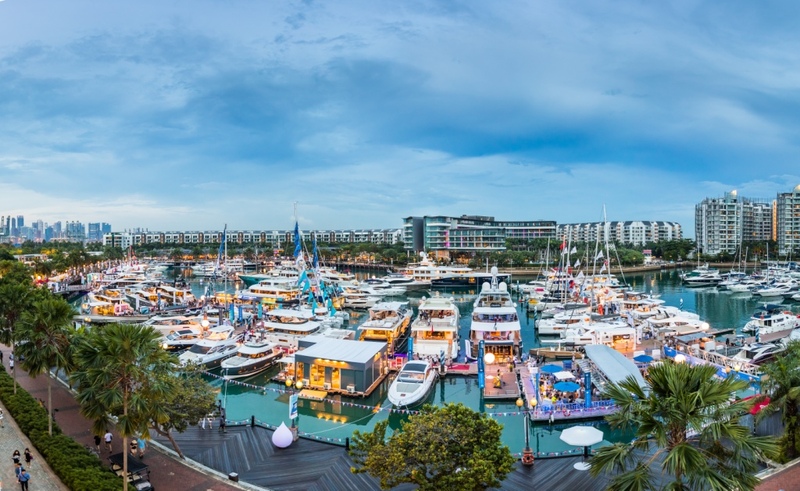 Once again, host venue ONE ̊15 Marina Sentosa Cove has become a nautical wonderland and is set to host more than 15,000 people during the four-day extravaganza. With over 100 brands represented and 90 yachts, boats and other watercraft on display, visitors can expect to see, buy or charter some of the world’s most desirable sail and motor yachts. Highlights include the incredible 59-metre luxury expedition yacht, M/Y Seawolf as well as the impressive 36.6m Tecnomar-Admiral built Tecnomar Evo 120 Ice White Edition, presented by The Italian Sea Group – Asia. As one of the longest-standing and biggest exhibitors of the show, Simpson Marine has a 16-fleet strong display – their largest ever – featuring two Asian premiers from Sanlorenzo and a number of Singapore debuts from their brand portfolio. Expect to see other impressive line ups from long-standing supporters Boat Lagoon Yachting, Princess Yachts, Ferretti Group, Hong Seh Marine, Azimut Yachts, Sunseeker and more. More than 25 boats will premiere at this year’s show, including the much-anticipated SILENT 55 , a fully solar-electric catamaran by SILENT-Yachts , the world’s first and only producer of ocean-going solar-powered catamarans. As the industry moves towards minimising its carbon footprint, the Palm Beach GT50 Express , which makes its Asia debut at the Show, is a noteworthy high-speed, fuel-efficient model. Joining the line-up of regionally popular medium-sized models is the 14-metre SACS Rebel 47 , which will make its Asia premiere with dealer Boat Lagoon Yachting . The Rebel 47 combines the best of a maxi-rib with features from a regular openyacht. Princess Yachts , together with Boat Lagoon Yachting, will be presenting five regional debuts, including the all-new F70 , F45 and R35 . Azimut’s Singapore-based dealer Marine Italia presents the Grande 25 METRI , Azimut 66 and the Azimut Fly 55 all making their Asian premiers. 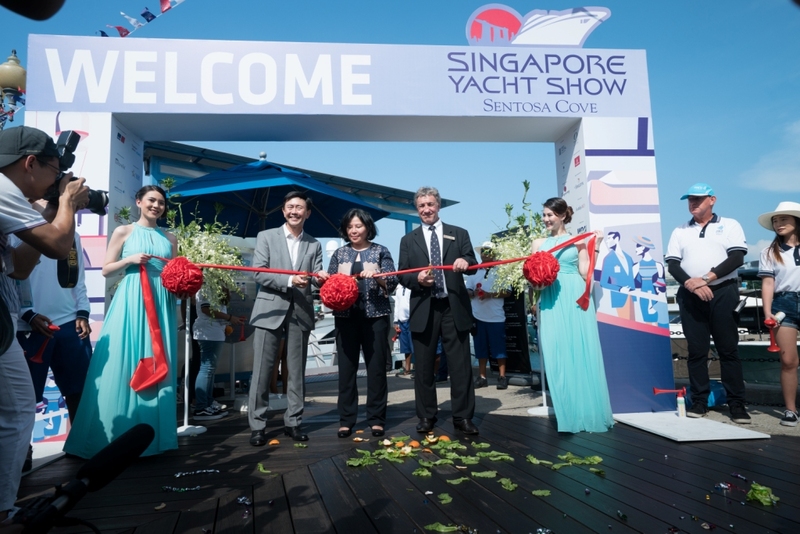 The Aquila 36 , Lagoon Seventy 7 and Lagoon 40 presented by Simpson Marine all grace the waters in Singapore for the first time. Those wanting to explore the world of day boats can look forward to Hong Seh Marine ’s introduction of two new yachts from Boston Whaler , the 350 Realm , along with the 320 Vantage . Leopard Catamarans ’ line-up features the award-winning Leopard 51PC for the first time in Singapore. For active boaters, Gulf Craft’ s stylish Silvercraft 36 HT and 31 HT on show with ProMarine will be sure to impress. Sport fishing enthusiasts eager for their next big catch will be particularly delighted by the robust yet easy-to-handle 36 HT, one of the finest models in the series. Feeling adventurous? Hop on board the M/Y Seawolf , a luxury expedition superyacht specialising in charters to some of the world’s farthest-flung destinations, a t 59-metres, Seawolf is also set to be the largest yacht featured at the Show this year. The 36.6-metre Tecnomar Evo 120 Ice White Edition built in 2018 by Tecnomar – Admiral is also a must-see. An Italian design icon, she cruises at 23kn and reaches a top speed of 2.2kn with room to comfortably sleep up to 10 guests. Other superyachts include Lürssen’s Be Mine (40.7m) , Perini Navi’s La Numero Uno (40m), Sanlorenzo’s SD126 (37m) and Princess Yachts’ Princess 30M (30m). Once again, SYS welcomes some of the world’s best-known custom and semi-custom superyacht builders; Amels , Benetti, Lürssen, Feadship, SilverYachts and Westport all have a presence at the Show, presenting a great opportunity for visitors to discover their latest launches and new concepts. More than just a boat show, SYS continues to set the bar high for demonstrations of the latest, most advanced personal watersports equipment and gadgets to get visitors’ adrenaline pumping. Hot favourites Flyboard and Waydoo Flyer – an electric hydrofoil board designed to enable users to fly above water – are among this year’s highlights at the Show’s On-water Demo Platform. Supercar enthusiasts who like their rides as sleek and luxurious on land as on water will be in for a treat over the weekend. The Supercar Parade on Saturday and Sunday will see car owners from the Lamborghini and Ferrari clubs driving convoys of their iconic vehicles into Sentosa Cove to gather at the Show’s Esplanade. In addition, Rolls-Royce will be showcasing three models of their 2018-launched Cullinan SUV as part of their partnership with Sanlorenzo and yacht dealer Simpson Marine . Taking cruising in style to the next level is the Bell Helicopter 505 , a new five-seat aircraft designed for safety, efficiency and reliability through the use of advanced avionics technology. Prices start from SGD22 for an advance single-day pass, and SGD154 for the single-day VIP pass, which can be purchased from the Singapore Yacht Show website .